9659-KS-DST is rated 4.9 out of 5 by 27. Rated 5 out of 5 by Mike C from Nice Piece Looks great and performs well. What more do need? 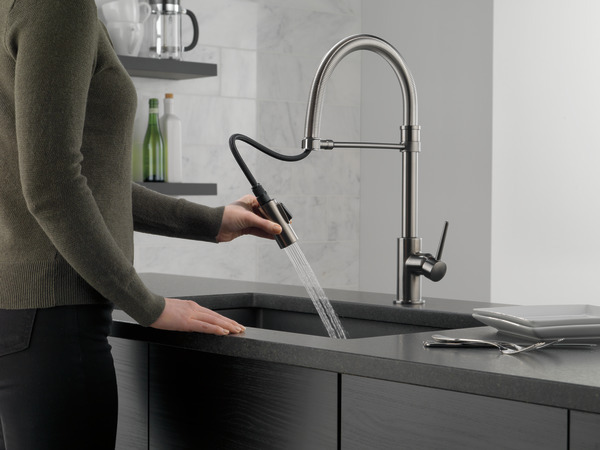 Rated 5 out of 5 by gaelicgal22 from The Triassic has much better action than many other restaurant-style faucets. Also better looking. 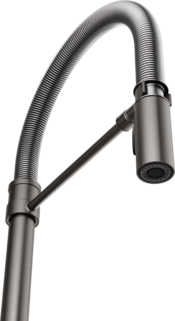 Every part of this product is substantial, much more so than the standard issue. 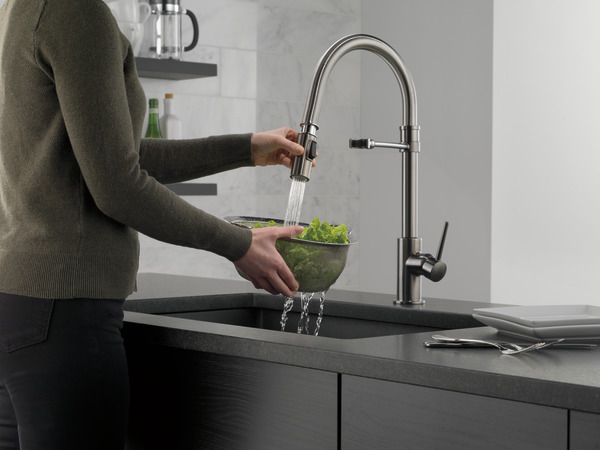 We have a large, deep sink, and our previous faucet (about the same size) was limited by its' fixed linking arm when you pulled the hose out to spray down the sink or rinse a large pan --- the Delta is MUCH more usable. 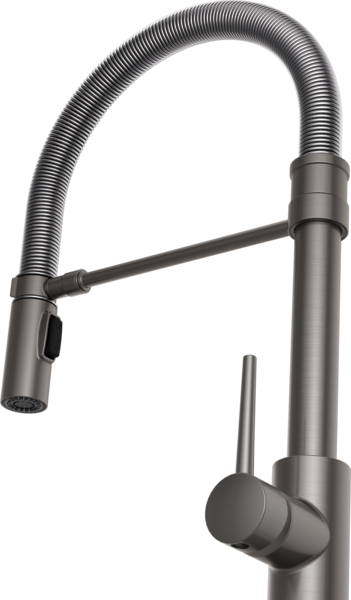 In addition, the previous faucet sprang a slow leak from its black pull-out hose after only 6 years of use --- down the back of the cabinet and wicking under the floor, necessitating replacing and refinishing part of the kitchen floor. It also had a "Lifetime Warranty" guarantee; but when I examined the fine print it says "this warranty applies to the finish only". Read the Delta warranty and you'll see there is no comparison. 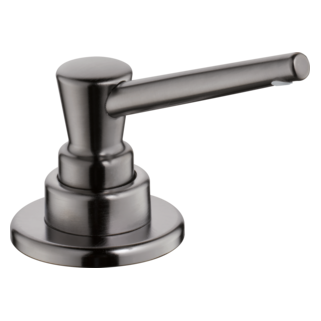 We just had our new bathroom done with all Delta fittings, and every plumber with whom we spoke likes the Delta quality. Rated 5 out of 5 by ErinRene from Ergonomic Beauty Faucet has grey pressure, spray and solid stream abilities. Sensor hands free feature excellent. Detachable arm wide circumference. Looks sleek and yet classically traditional. Color temperature mode is visually efficient. 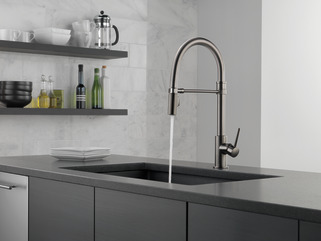 Rated 5 out of 5 by kathylbs from This faucet looks so great in any style kitchen. We put it in a relatively traditional kitchen, and it really looks great, and functions so well. it' this is the coolest faucet ever. I love the pull down feature, it is so neat the way you have options. The sink is well worth the price, the design is clean the function is smooth. I Love it. 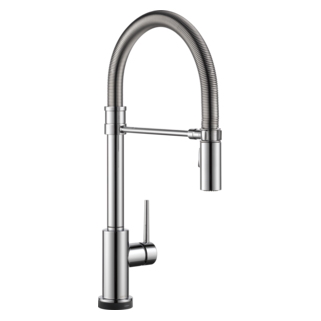 Rated 5 out of 5 by Jeff from Perfect faucet I'm a contractor who purchased the faucet for a kitchen remodel after the homeowners made the selection. The faucet looks very nice and they are pleased with it thus far. 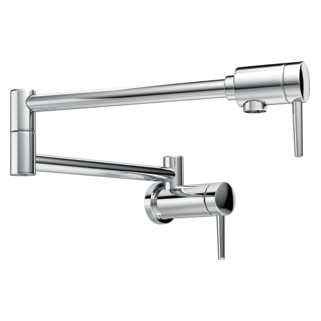 Rated 5 out of 5 by Adrienne from Great looking & functional Nice looking, industrial style faucet. 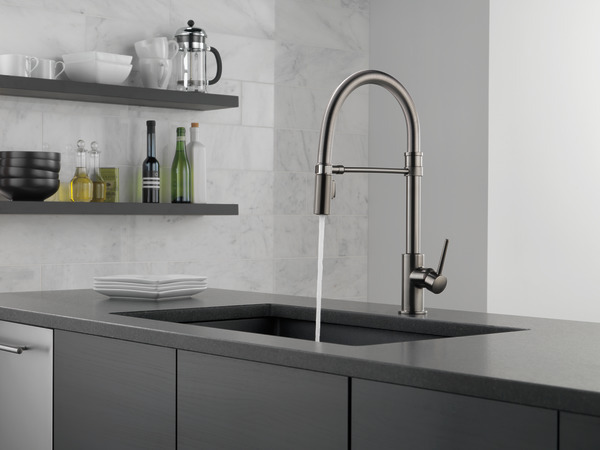 Design allows for easy cleaning of large pots, baking sheets, etc with little to no water splashing outside the sink. Delivery was prompt and faucet well-packaged. We had it professionally installed because we were having other plumbing issues taken care of, but it looks relatively simple to DIY. We've only had it installed a couple of days so can't speak to long term quality but it feels very sturdy. Good to note: it is large! 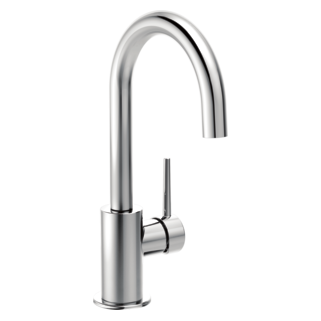 It looks good in our stainless steel heavy kitchen, would be best suited for a larger kitchen or island. 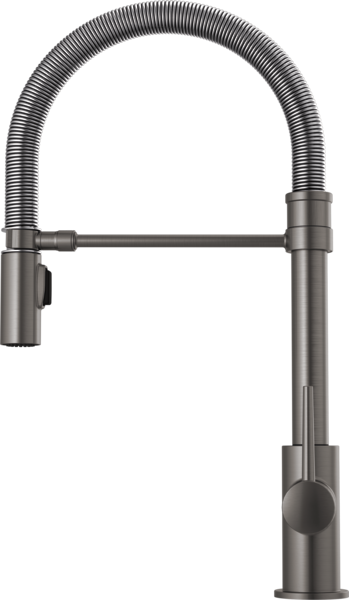 Was this faucet manufactured with Physical Vapor Deposition (PVD) process? 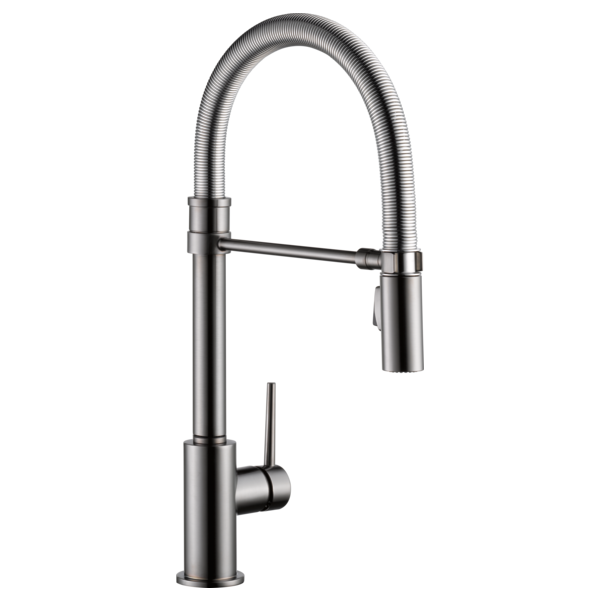 Is there an air gap with the same finish black stainless.? Is the body and wand of this product all stainless or are the components plastic? What diameter hole needs to be cut in my countertop for installation? &nbsp;I can not find the diameter size on the manual. Is this faucet California compliant? Is this faucet California compliant ? Hi. 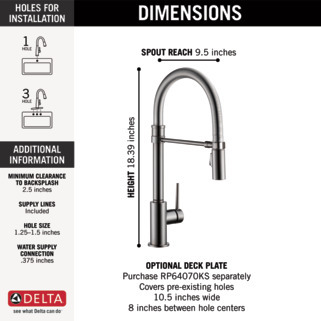 What other parts do I need to buy for this faucet to be installed? What is the difference between the Trinsic Pro and the Trask Pro found only at Lowe's? Are they made from the same materials?